I've had a neat puzzle bookmarked for a while: the Naef Cubicus. It's a set of shapes that fit together in many interesting ways and form a full cube of 64 blocks when packed together correctly. What caught my eye was the diversity of shapes it could be assembled into, but the downside was the cost: paying $100-$300 for some blocks isn't really my thing, even if solving puzzles is. What's great about this project is that the little cubes are just square cutouts on thick plywood, so they can be made even from the smallest of scraps. For mine I used 1/4" thick plywood so I cut out 1/4" x 1/4" squares, thus making cubes with 1/4" sides (roughly; kerf wasn't too big of a deal). That made dark and light faces (light from the wood, dark from cut edges) that I could rotate and make interesting patterns while gluing the pieces together. The size of the squares that you laser cut depends on the thickness of your plywood. Since I used 1/4" thick plywood, I cut out 1/4" x 1/4" squares, thus making cubes with 1/4" sides. For 1/8" thick plywood, you'd cut out 1/8" x 1/8", and so on. For making the file (Illustrator file attached to this step), I tried two different ways. I tried a linear array of squares spaced out evenly and a grid of squares interfacing with each other (i.e. square grid). These two ways were to test a) the possibility of a fire happening from laser cutting a grid of such small squares and b) the charring of the edges from laser cutting the grid. The grid is advantageous in that it's faster to cut and saves more plywood, but those two effects might be problematic. However, when I finally went to cut it, both methods (grid and spaced out array) worked just about comparably. The grid did have a bit more charring, but only if you looked really closely -- in my eyes, it made little difference. In any case: cut out 64 squares, either by having a spaced out linear array or by cutting a square grid (9 lines by 9 lines). Now that you have cubes, let's begin assembly! Quick note on checkerboard patterning: the laser cut cubes have two light faces (from the wood) and four dark faces (from the cuts). The dark faces also have visible lines from the layers within the plywood. 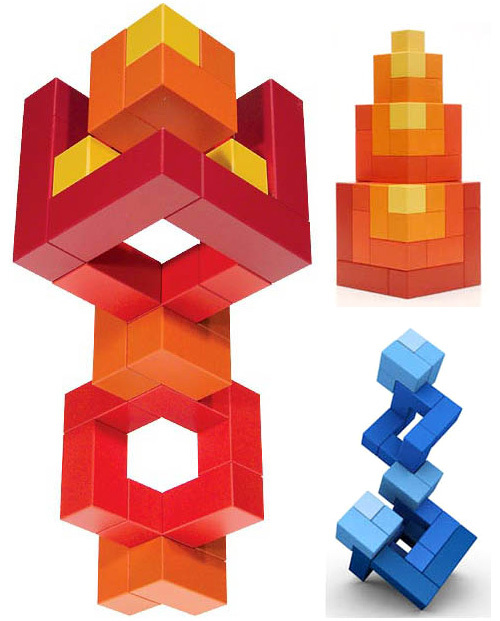 Altogether, by rotating your cubes as you assemble the puzzle pieces, you can get interesting designs. Begin by gluing four cubes in a line. It's VERY important throughout the assembly process that your cubes are as straight and parallel/perpendicular to each other as possible -- no crookedness! Rotate the cubes however you'd like. In my case, instead of lining up light faces with light faces or anything, I just glued them semi-randomly -- see the first and second pictures to see what I mean. I really liked how the random effect showed up in the final puzzle. Add another 3 cubes at a 90 degree angle from the end of the first four cubes. Again, rotate the cubes and create whatever pattern you'd like. After those three, add another 3 cubes that are perpendicular to the plane that the first seven cubes occupy -- see the fourth image above for what I mean. I wanted there to be a little method to the madness of my cube rotations so I made the two sides of my puzzle pieces symmetric. Thus, you can see in the fifth image above that the next 3 cubes that I added are symmetric to the three cubes directly opposite. Add 5 more cubes to get what you see in the sixth image above, and your first puzzle piece (and hardest) is complete! This next puzzle piece has the same basic shape as the previous one, but it's slightly smaller. Begin by connecting three cubes in a line. Then add two cubes perpendicular to those first three, as shown in the second picture above. Add another two cubes perpendicular to the plane of the first five cubes, as shown in the third image above. Symmetry time: add the next two cubes as shown in the fourth image above, ensuring that they match the two cubes directly opposite. Add three more cubes, keeping symmetry in mind, until you get the final form shown in the seventh image above. At this point, check that your pieces fit together: this one should fit into the previous picture as shown in the last image above. Again, this next puzzle piece has the same basic shape as the previous two, but it's the smallest version. Begin by connecting two cubes in a line. Then add one cube perpendicular to those first two, as shown in the second picture above. Add another cube perpendicular to the plane of the first three cubes, as shown in the third image above. Keeping symmetry in mind, add another cube opposite to the one you just glued, as shown in the fourth picture above. Finish off the puzzle piece with one more cube to get what's shown in the fifth image above. Again, at this point you check that your pieces fit together: this one should fit into the previous two pieces as shown in the last image above. And that's 64 cubes total! These are all the pieces you need to start building. The main shape that the Naef Cubicus puzzle forms is a cube (surprise, surprise). To make it, see the step by step instructions in the pictures above (or see this great video for cube and more shapes). I have some example shapes that I made when fooling around with the puzzle, but what other shapes can you think of? You can always make additional, bigger puzzle pieces to make your cube bigger (so 5x5x5 cube and up) and have more pieces to make more geometric designs. Alternatively, check out other Naef puzzles -- which other ones can you make using this laser-cut-squares technique? As always, leave questions and comments below. Enjoy!